Bechem United FC is struggling in the 2011-2012 GLO Premier League but the newcomers have one of the most interesting teenage footballers in their squad, the 1994-born Princebell Addico. My first record of Addico is from September 2010 when he was part of the Ghana U-17 national football team. A few months later, In March 2011, Addico spent some time at Italian side Parma AC, being described as a very interesting prospect. 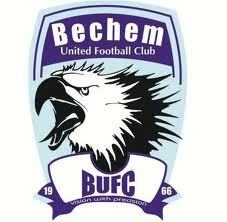 As far as I know, Addico joined Bechem United FC somewhere between March 2011 and September 2011. Bechem United FC won promotion to the GLO Premier League in May 2011 and in September 2011, Addico was named in a list of “New Players” for the up-coming season. According to unconfirmed sources, Addico trained with Palermo in the Italian Serie A in October 2011. In early November 2011, Addico was part of the Ghana U-20 national football team, playing a couple of friendly matches in Italy. His stay in Italy explains why Addico had to wait until Round 9 to make his debut in the GLO Premier League, more precisely on 30.11.2011 against AshantiGold SC. Addico has been playing regularly ever since. Addico has yet to score his first league goal. I have seen Addico once, on 03.12.2011 against Berekum Chelsea FC. Addico impressed me immediately. Addico is a tall, athletic, elegant player, apparently just as comfortable in the central defence as in a midfield role. Addico has a number of skills, including hard, fair tackles and accurate passes. He has a great all-round view and played with a maturity beyong his young age. He does not seem all that creative and seems best suited as a defensive midfielder or holding midfielder, breaking up the play of the opposition and screening the defense. I think Addico has primarily been playing in defence for Ghana U-17 and Ghana U-20. Watch out for this talented youngster who I think can reach far in the world of football. prince bello is a young talented futbala…i hope 2 see him sun at barca…gudluck kid..